Braces use constant, gentle pressure, which over time, move teeth into their proper positions. Your braces are at work every moment of your orthodontic treatment. The two main components of your braces are: the brackets that are placed on your teeth and the main archwire that connects them. The bracket is a piece of shaped metal or ceramic that we affix to each tooth. The archwire is bent to reflect your “ideal” bite. In other words, it reflects the way we want you to look after treatment. To discuss getting braces in the area, please feel free to contact usto schedule an appointment. 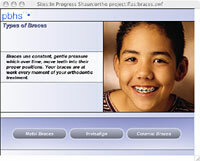 Metal braces are the most popular with kids and teenagers. They love using different colors of ligature ties. These braces are much smaller than ever before. Self-ligating metal brackets reduce friction between brackets and wires by eliminating use of ligature ties. Thus, it can reduce total treatment time. Translucent clear ceramic braces are the most popular with adults. You have to be very close to someone to be able to see them. Yet, because they are a ceramic material, they are more fragile.